I am sure it is no problem in your hall closet but if you have a wine cellar one other factor needs to be considered. Humidity is just as important. Too little and your corks stand a chance of drying from the outside in and too much you could end up with a mold problem destroying labels. 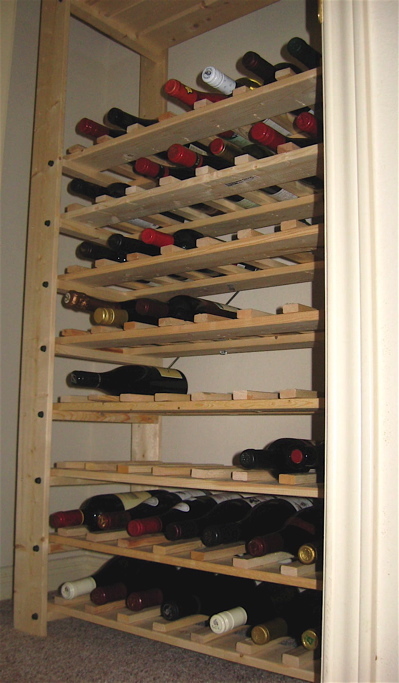 Again while it is no problem in your hall closet, using pine wine racks could be a problem. Pine attracts molds readily and once it establishes on your wine racks, especially black molds, it is difficult to eradicate. You need to use redwood or cedar. I guess that is why cedar shingles are used.Here is to happy cellaring. I feel you, especially after just moving boxes around to find an appropriate bottle of bubby to chill for the oysters BK kindly brought me for dinner. I hate not being able to get my hands on any given bottle. But with the fridge and racks full and the fact that we’re renting a place with only one real closet, there aren’t too many options. I have the same setup in my basement. I rather like it – not flashy of course, but holds the bottle like a rock star.